Last week a book shaped package made a weighty thud onto my desk, the latest book from Neal’s Yard had made its way into my possession. I resisted temptation to read from cover to cover and after work rushed home to absorb myself in all things healthy and foody and I wasn’t disappointed. 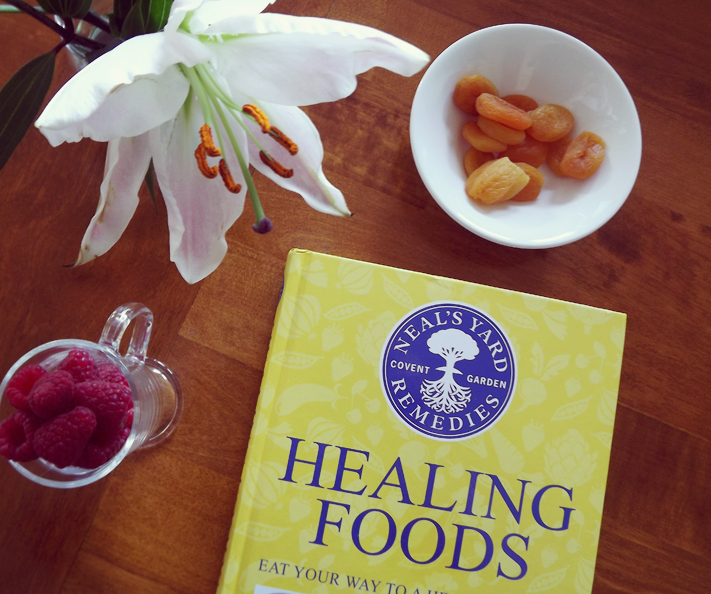 “Healing Foods”* was released on the 1st May and is 352 pages of beautifully photographed healthy meals and clean layouts making it an easy read. It’s introduction touches on the different diets throughout the world and covers the world of organic and genetically modified foods – making the weekly shop feel a little less daunting. The first third of the book covers almost every food I can think of (and some I didn’t know existed), stating why each food is good for you, how to get the best from it and how to cook/use it. The next section shows different meal combinations that aid different ailments – there’s even a “day of skin health” plan for days when your skin needs an extra boost – yes, i’ll take that one please! The last part of the book contains over 130 recipes from breakfasts to drinks, each with different symbols to highlight which part’s of the body that meal will aid. 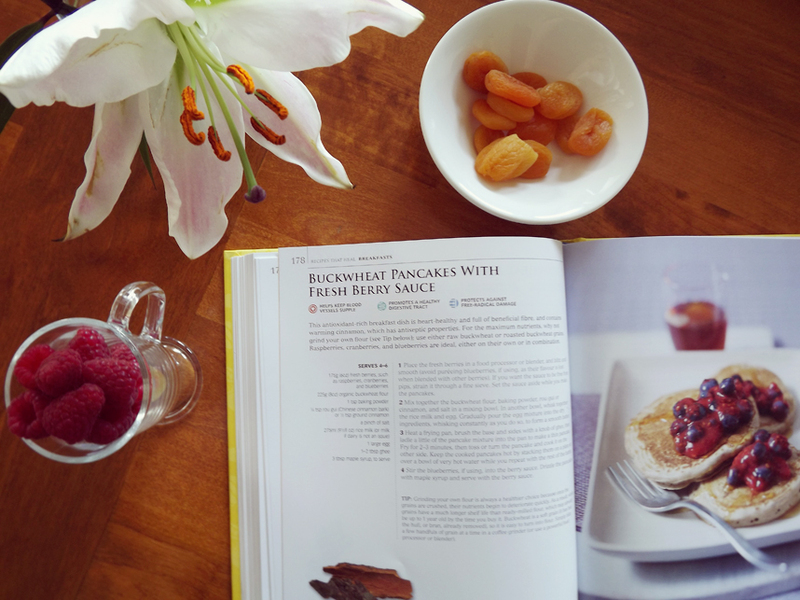 I’ve got the buckwheat pancakes with fresh berry sauce at the top of my list for things to bake this weekend! Retailing at £16.99, this baby is no budget book, but it will be something that I keep forever as reference and will really come in handy over the next few months as I attempt to get back into eating healthily again. Will I be able to forego cookies in hope of a healthier life? Well, let’s not get ahead of ourselves there. I’m a big advocate of everything in moderation, but having more knowledge on the foods you put into your body does help you to make better choices when doing that supermarket sweep style dash around Sainburys on your lunch break! Love the look of this! I'm starting to eat more healthily too and this sounds like it would be really helpful. This sounds like the perfect reference book, I love how it puts plans together like the day of skin health – I NEED! Ah it sounds mazing, just what I need. Let us know how it goes, maybe even some of your fav recipes would be cool on here?